The MEF17 flew by and we are back from Sunshine State Florida. 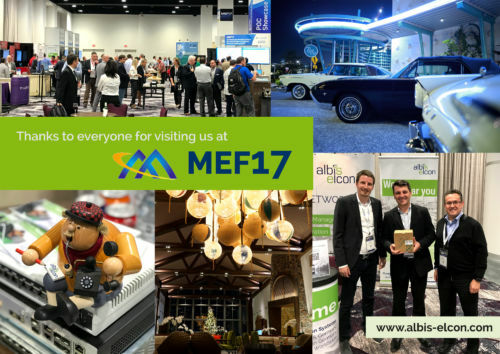 From 13-16 November, the MEF17 took place at the Loews Sapphire Falls Resort in Orlando and offered its participants beautiful sunshine and Orlando’s breathtaking scenery as well as a framework for sharing the industry’s latest develompents, live demonstrations, conferences and workshops. This year albis-elcon participated directly as an exhibitor at the MEF global networking event at the first time. We were able to gather many experiences, made new contacts from which interesting projects could arise and got insights into the new MEF 3.0. MEF 3.0 is a transformational framework for defining, delivering, and certifying agile, assured, and orchestrated communication services across a global ecosystem of automated networks. Highlight of our booth was our original handmade “Made in Germany” albis-elcon “Räuchermännl”, which drew the attention of the visitors by its Christmas smell and brought us interesting conversations. Every day a smoking man was raffled and handed over directly to the lucky winners, so that they are prepared for the coming Advent season with a nice memory of the MEF17 and of course – albis elcon. ;)In addition to our “Räuchermännl”, it was also able to see some of our MEF-certified products, such as the all-in-one universal demarcation device BIG 2862 or the Acceed 4420 for bandwidths up to 10 gigabits per second., Furthermore, visitors of our booth were able to find out more about our diverse range of products and solutions for the areas of Energy Management, Business Access & Backhaul, IPTV, Network Migration and Network Management. We would like to thank all exhibitors, visitors and the organizers for the successful event. We are glad to have participated this year. See you next year at the MEF18 in Los Angeles!